There was a time when the Brickell neighborhood featured a subdivision so extravagant that locals referred to it as Miami’s Gold Coast. The homes were spacious, beautiful and extravagant. The area was a mix of pioneers who made their riches in Miami, and industrialists who relocated to Miami after building their wealth in other parts of the country. However, the subdivision was built on property that was once dismissed as a useless mangrove swamp. It took the right vision to see the potential of the land. Locke T. Highleyman was that visionary. He took one look at the view of Biscayne Bay from the edge of this land and knew he could find a way to build a fine neighborhood of beautiful homes. Locke T. Highleyman was a wealthy real estate developer from St. Louis, Missouri, when he first arrived in Miami in 1901. He was a winter visitor until he decided to become a full time Miami resident in 1910. After deciding to relocate to South Florida permanently, he purchased a block of twenty eight acres of land from the Brickell family. The acreage was located just south of a home owned by the Bliss family at 1305 Brickell Avenue. Their home was situated between Brickell Avenue and the bay on SE Thirteenth Street. The acreage of land that Highleyman purchased was largely underwater and considered a swampy mangrove. 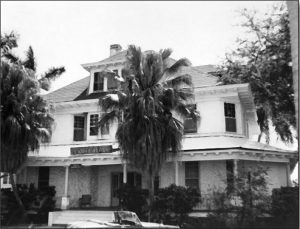 When Highleyman purchased the land from the Brickells in 1911, there were very few homes located in this part of the Southside neighborhood, now known as Brickell. Shortly after Highleyman made his investment, James Deering purchased a large tract of land from Mary Brickell to build Vizcaya. Deering’s estate was about a mile and a half south of Highleyman’s land. The fact that Deering choose to build his winter home in the area improved the value of Highleyman’s investment. It also improved his ability to attract other affluent families to purchase their winter homes in the subdivision he would later call Point View. It isn’t clear how or when an introduction was made, but Highleyman met John Collins and Thomas Pancoast shortly after permanently moving to Miami. The men became friends. At some point during their friendship, Highleyman was convinced to invest in a wooden bridge that Collins was building to provide access to what would become Miami Beach. Highleyman did not have long term interest in Collin’s project. In conjunction with other bank loans, Locke provided enough money to finance only a partial completion of the bridge. The project was finished when one of Highleyman’s newest neighbors took an interest in the bridge and the land at which the bridge terminated. 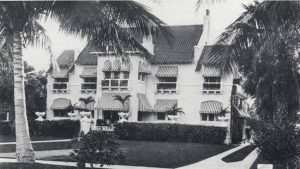 In 1912, Bliss decided to sell the family home at 1305 Brickell Avenue to a buyer who never visited the property. The buyer was Carl Fisher. He and his wife, Jane, fell in love with the area, and they chose to retire in Miami. At least, Carl Fisher’s version of retirement. On the very first visit to the home Jane commented on how the trees on the property cast a beautiful shadow over the driveway. Carl Fisher took that opportunity to name their home “The Shadows”. He was so found of the moniker that he later gave the same name to his home on Miami Beach and two of his yachts. Although there are many stories on how Carl Fisher met John Collins, the one told by Daly Highleyman was that his father introduced the two men. Daly was Locke’s son. Fisher took a very keen interest in Collin’s land which ultimately led to an agreement for Fisher to help Collins finish the wooden bridge. Collins and Fisher would go on to be the catalyst of the building and incorporation of Miami Beach. Regardless of the story that brought the men together, Fisher’s investment in the bridge allowed Collins to repay Highleyman the amount he loaned him. The repayment was timely because the project of preparing his land for development was proving to be more costly than Highleyman originally calculated. The property that Highleyman purchased was far from ready to begin building a sub-division of homes. The acreage was located east of Brickell Avenue, between SE 14th Street and SE 15th Road. The property was a mangrove swamp and it was more standing water than dry land. While most people saw a “worthless swamp”, Highleyman saw land that possessed a magnificent panorama of Biscayne Bay. He was intent on finding a way to convert the land from swamp to solid ground. While waiting to build their first home in Point View, the Highleyman family occupied a home on the northwestern edge of his land at 1309 Brickell Avenue. It was from this vantage point that Locke saw the potential. He looked out over his property and developed a plan to use a dredge to not only fill the swamp, but to also extend his property with bay bottom using the same process. The transformation required a seawall, a dredge, and a lot of effort and time. The fill effort started at the edge of Brickell Avenue and worked east. Highleyman solicited the help of one of his neighbors, George F. Cook, who lived across the street from Highleyman at 1310 Brickell Avenue. Cook purchased the property at the northeast corner of 15th Road and Brickell Avenue, which is why he helped Highleyman prepare the land for development. The two men were able to fill the land using 180,000 cubic yards of sand and other materials from the bottom of Biscayne Bay. The dredge and fill process ranged from a few inches near Brickell Avenue to up to five feet near Cook’s property. Cook was the first to build a home in Point View. His home cost $6500 and was built with reinforced concrete. In addition to filling swamp land, the two men also built a 2100 foot long, concrete reinforced bulkhead along the coast line of Point View. The land along the seawall was newly created and provided the most valuable lots in Point View. By the end of 1912, the land was nearing readiness but needed time to settle before being ready to construct homes. One interested spectator in the dredge and fill process was Carl Fisher. 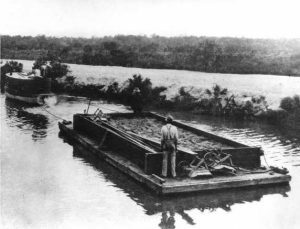 Highleyman was one of the first to use a dredge to expand water front property. The ability to create land from bay bottom was not lost on Fisher. He would later use dredges to expand his land investment on Miami Beach. While the land settled, infrastructure was provided in the new subdivision. Sewers were installed, traversing the alleys instead of the streets. Cement sidewalks and gutters were laid. Every street was paved with rock and then rolled to provide a firm surface. The first street to be laid was called Kathryn Street. Prior to 1920, it was up to each developer to construct and name their streets. Locke Highleyman named the first street in honor of his wife Kathryn. As part of the implementation of the Chaille street naming system in 1920, the street was renamed to SE 14th Street. The road opposite of Kathryn Street was called Broadway and is currently known as SE 15th Road. The street that ran along the seawall was called South Bay Shore Drive and is currently known as Brickell Bay Drive. Lastly, the U-shaped street in the middle was called Point View Place and is now known as SE 14th Terrace and turns into SE 14th Lane. Once preparation of the land was complete, Highleyman built four homes in Point View. All of the homes were built along Brickell Bay Drive and featured a beautiful view of Biscayne Bay. The road was called South Bay Shore Drive until the mid-2000s, when it was changed to Brickell Bay Drive. The first home was completed in early 1915 and was located at 1412 South Bay Shore Drive. The family moved from their original home on Brickell Avenue to this home in Point View. The Highleyman family lived in the home until it was sold to J.P. Logan of Asbury Park, New Jersey, in February of 1916. At the time the home was sold, the Highleyman’s second home was being built one lot to the south of the first home. Locke insisted that his family was committed to staying in Point View. In an article in the Miami Herald announcing the sale of the home to Logan, he said “in the event I sell my other home, I will certainly build another. I will not leave Point View”. Locke Highleyman also built a spec home with the intention to sell. The home was located at 1402 South Bay Shore Drive, just a couple of lots to the north and around the bend from the first Highleyman family home. According to Daly Highleyman, he was ten years old when he played real estate agent and sold the home. A husband and wife arrived to the Highleyman home and wanted to see the spec home. However, neither Locke nor Kathryn were home to show them the house. Ten year old Daly knew where his father kept the keys and walked the couple through the house. After they agreed to buy the house, Kathryn said to Locke, “you owe Daly a commission”. Locke asked Daly what he wanted for commission and he requested a racing bicycle. Daly got his wish and both seller and real estate agent were happy with the compensation. The buyer of the home was Aubert and Gertrude Fay of Lowell, Massachusetts. The couple purchased the home in March of 1916 and it remained in the family into the 1960s. Fay made his fortune selling Father John’s Cough Syrup. He purchased the home to retire in Miami. Following ownership by the Fays, the home was converted into the Commodore’s Club. It was demolished in 1988 to make room for the Commodore Bay Condominiums. Highleyman hired August Geiger to design his second family home. The address was 1418 South Bay Shore Drive and was located next door to his first home. The Geiger designed home consisted of twelve rooms with guest quarters in the back. It was completed in November of 1916. JP Logan took possession of 1412 Bay Shore Drive the same month that the Highleyman family moved next door. The Highleyman family lived in the Geiger designed home for a little more than a year when Locke received an offer he couldn’t refuse. He sold the family’s second Point View home to Charles F. McGilvray in early 1918. 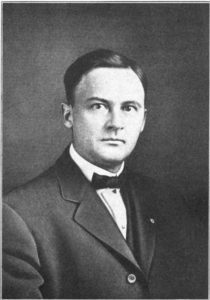 McGilvray was the president and general manager of Robbins and Myers Company of Springfield, Ohio. The architect that designed the third Highleyman family home in Point View was Walter De Garmo. In addition to designing the Highleyman home, he was a prominent architect that designed many homes, entrances and buildings in Coral Gables. The third home was located at 1420 South Bay Shore Drive. It was designed in a Mediterranean Revival style of architecture and consisted of twenty two rooms. It was located south of Highleyman’s second home and north of the home of Frank B. Shutts. The family moved into the De Garmo built home in early 1919. However, they remained in the home for less than one year. The Highleyman’s rented their home during the winter season of 1920. The mansion was leased by William H Luden. At the end of the season, Luden decided to purchase the home in March of 1920. He lived in the estate until he sold it in March of 1925. After selling the third home he built for his family, Highleyman was ready to move onto his next project. In partnership with Clarence Busch, he established a company called the Biscayne Bay Island Company. The company was responsible for creating and developing Palm and Hibiscus Islands on Biscayne Bay. After selling his last Point View home, Locke and his family moved to a home he built on Palm Island. In addition to real estate development, Locke T. Highleyman was very active in the Miami community. He served on the board and was actively involved with managing Fidelity Bank and Trust from 1916 through 1921. He also served on the Miami City Council for four years. Highleyman was considered entrenched in the political, business and social circles of Miami. Maintaining a very active pace since settling in Miami in 1910, Locke decided it was time to retire in 1929 at the age of fifty nine. Around the same time, Locke and Kathryn separated. He felt the time was right to leave Miami and decided to travel Europe. He eventually made his home in Spain. Locke and Kathryn got divorced in October of 1931. Several years later, Locke got remarried to Yvonne L. Jussalume in 1935. The couple were married in Barcelona, Spain. Locke lived his later years in La Jolla, California until his death on May 19, 1952. He died peacefully in his home at the age of eighty two. 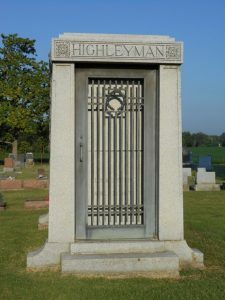 He was buried at the Crown Hill Cemetery in Sedalia, Missouri. Although Point View still exists as a sub-division in the Brickell neighborhood, it looks nothing like it did during its prominent years in the early to mid-twentieth century. What was once the gold coast of Miami is now a canyon of condominiums that were built from the mid-1960s through the mid-1990s. All of the mansions in Point View were knocked down beginning in the 1960s and ending with the last one being demolished in 1988. The neighborhood changed quickly and the land was deemed too valuable for single family homes. The area got re-zoned and the homes were replaced with condominiums. The early residents of Point View were self-made millionaires. They were the products of the Gilded Age and chose to live their winter months and retirement years in Point View. Once mangrove swamp, the sub-division became one of the most desirable places to live in Miami. This is the first of several articles detailing the residents and homes that once resided in Point View. It was a fascinating and elegant looking subdivision. Given all the changes in the area, it is also a largely forgotten place. 8 Comments on "Point View Subdivision in Brickell"
As usual Casey a great read and Thank You again for your remarkable work in providing a detailed looked back into Miami’s history – before wall to wall concrete and asphalt took over. Super story! Nice in-depth look at both the people and the place. Thank you Casey. I’m the great grandson of Geo. F. Cook. I learn more and more on him as I get older. Thank you so much for all this interesting information. Do you know who owns the first picture on the article? The aerial photo of Point View in 1920s I would like to buy a copy of it and any other similar photos of the area in the 1920s and 1930s. Thank you, Virginia. I believe you can find the image at HistoryMiami. The image was also found in the book “Miami Then and Now” by Arva Moore Parks and Carolyn Klepser. Contact Ashley at the HistoryMiami Research Center and she will be able to help you! Thank you so much Casey. I really appreciate the information. My daughter actually worked with Ashley at HistoryMiami. I will reach out to her. Thanks again! I have been asked to write a book about my grandfather, Locke Tiffin Highleyman. Thank you for this article. Any further information would be much appreciated and credit given. I never met him.